Usually, I write about cases because I find them “interesting.” And by interesting, I mean that in the most clinically (to most) boring way because they either expand, restrict or offer some other exciting (to me) “twist” to the law. Sometimes though I run across a case that is interesting simply because it is. Garibotti was comedian Joey Bishop’s girlfriend for over 20 years. She lived with him in his home on Lido Island in Newport Beach for the last 10 years of his life. Bishop died in October 2007, and Garibotti was one of his estate’s major beneficiaries. She continued to live in the Lido Island residence for about a year after Bishop’s death, until the trustee of the Joey and Sylvia Bishop Revocable Trust (Trust) began to prepare the residence for sale. At the time of Bishop’s death, the Lido Island residence contained irreplaceable and priceless jewelry, paintings, antique furnishings, and other personal property, mementos, trophies, and memorabilia Bishop had acquired over a lifetime in show business and as a member of Frank Sinatra’s “Rat Pack.” Although the Trust owned many of the items, Garibotti also owned some of the personal property found in the home. During his lifetime, Bishop hired Hinkle to perform construction projects at the Lido Island residence based on Hinkle’s claim he was a skilled and licensed contractor. Hinkle was neither. He often failed to appear at the job site during projects and the work he performed did not comply with the Uniform Building Code or other industry standards. After Bishop’s death, Hinkle convinced the Trust’s trustee that he was Bishop’s good friend and a licensed contractor who could help renovate the Lido Island residence and prepare it for sale. The trustee hired Hinkle to pack the residence’s furnishings and other contents, move those items to a storage facility, and perform work at the residence. Hinkle’s construction work again failed to comply with the Uniform Building Code and other industry standards. Hinkle also stole many of the items he was supposed to move to storage, vandalized other pieces of personal property, and damaged or lost many of the items during transport and storage. A construction case and the Rat Pack. Cool. Now, which one was Joey Bishop? Wasn’t it Frank Sinatra’s 100th birthday this past year? And, if so, how in the heck old did that make Joey Bishop’s girlfriend Garibotti? Garibotti the “girlfriend” is clearly not “Sylvia Bishop” of the “Joey and Sylvia Bishop Revocable Trust,” and if Garibotti was kicked out of Bishop’s house shortly after he died, why is she suing Hinkle for construction defects? So, we know Frank. We also know Sammy. And we know Dean. Joey must be that other guy. Or was there only one other guy? Nope there were five of them. Peter Lawford is the guy in the picture above on the far left. He’s the guy you might remember as “that other guy.” And Joey, who hardly looks like a “comedian” at all, and in fact looks like he was Photoshopped into the photograph, is the guy to the far right with that “what the heck am I doing here” look. 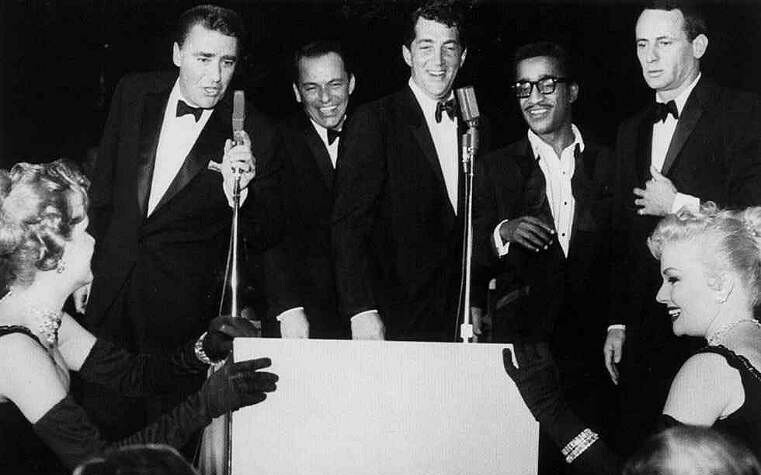 An interesting side note: Frank, Sammy, Dean, Peter, and Joey never referred to themselves as the “Rat Pack.” They referred to themselves as “the Summit” or “the Clan.” How the name “Rat Pack” came to be is shrouded in mystery. One popular version, with it’s own surprise twist (at least to me), is that Humphrey Bogart’s wife Lauren Bacall came up with the name. More on that in a bit. But, the surprise is that Bogart, not Frank Sinatra, was actually the Big Cheese of the Rat Pack until he died in 1957. According to legend, Bacall after seeing the fellas stumble home after a late night in Las Vegas said words to the effect “You look like a pack of rats.” Which sounds just like something Bacall would say. And whether true or not, the name stuck. So, Frank Sinatra’s 100th birthday was in 2015. He was born on December 12, 1915 in, as we all know, Hoboken, NJ. Joey Bishop was a few years younger. He was born in 1918, was 89 years old when he died in 2007, and would have been 97 years old at the time of the Garibotti v. Hinkle case. According to Michael Starr, the author of a 2002 biography on Bishop called “Mouse in the Rat Pack,” when he visited Bishop on Lido Island in 1999 while writing the biography, Bishop’s wife Sylvia was at the residence. She died later that year. That would make Garibotti, at least then, somewhat less than a “girlfriend.” According to Starr, Garibotti met Bishop when Bishop was 66 years old and she was . . . wait for it . . . 16. Which places her around her late 40s today. And while Garibotti may have just gotten her learner’s permit when she and Bishop met she apparently knows how to navigate her way around the legal system. After Bishop died in 2007, she sued for a large portion of his estate. A documentary on the lawsuit, in which Garibotti was interviewed, was aired on an episode of a tv show called “The Will: Family Secrets Revealed.” Garibotti didn’t much like it and she sued the producers. She apparently didn’t like Hinkle either. As for the case itself, there’s not much to say other than that while Garibotti sued Hinkle for construction defects,the lower court found that she didn’t have standing because only the “Trust” not “Garibotti” had the right to bring claims for construction defects. Tagged: Dean Martin, Frank Sinatra, Garibotti, Hinkle, Joey Bishop, Peter Lawford, Rat Pack, Sammy Davis Jr.